Scanned at 600 ppi TIFF format, resized to 72 ppi JPEG format. Photograph of Celia B. Allen, Professor of Psychology at Eastern Washington College of Education (currently Eastern Washington University). Mrs. Allen was the first person to earn a Master of Arts in Education degree from Eastern. 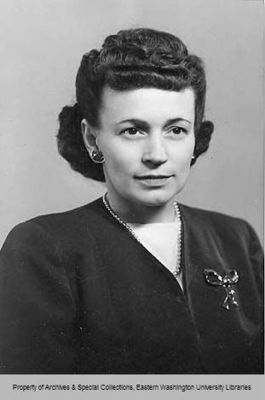 She was a member of the faculty from 1948 until 1972. Archives & Special Collections, Eastern Washington University Libraries.